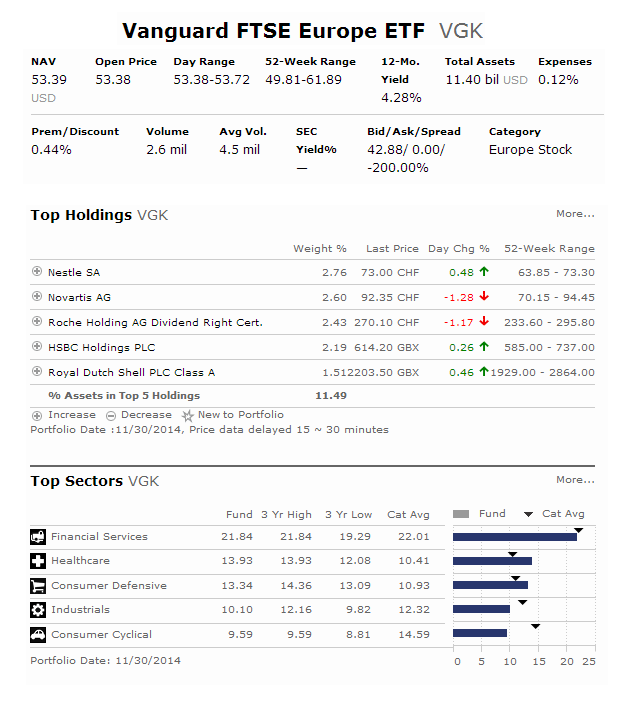 Vanguard FTSE Europe ETF (VGK) is an international stock exchange traded fund. This index ETF uses its assets to purchase stocks of companies located in major markets of Europe. This fund will invest in companies located in Austria France, Germany, Greece, Italy, the Netherlands, Norway, Portugal, Spain, Switzerland, the United Kingdom, and more. This equity fund is tracking the return of the FTSE Developed Europe Index since 2013, before it is tracking MSCI Europe Index. This equity fund has high potential for growth, but also high risk. The fund manager is Gerard C. O'Reilly since 2008. It has a low expense fee of 0.10%. The current dividend yield is 4.28%. The share price is valued at $53.68. This popular ETF has large assets of $18 billion. You can buy this ETF through your brokerage such as Vanguard, Fidelity, TD Ameritrade, etc. The fund advisor is Vanguard Equity Investment Group. This fund has 528 stocks in its portfolio. The top 5 stocks are Nestle SA, Novartis AG, Royal Dutch Shell plc, Roche Holding AG, HSBC Holdings plc, and Bayer AG. Top 6 countries in its assets are UK, Switzerland, France, Germany, Spain, and Sweden. The investment risks are stock market risk, country risk, developed markets risk, currency risk, and other investment risks. This Vanguard FTSE Europe ETF has a low expense fee. This index fund is a great choice as one of your core investment funds.